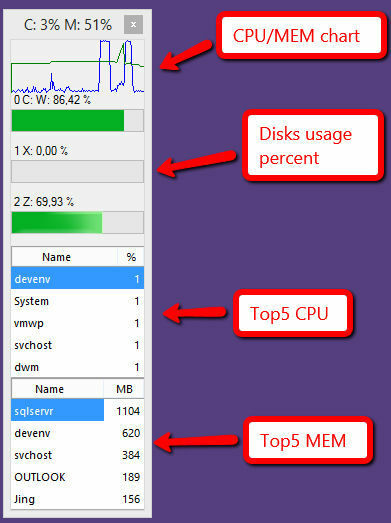 Top Process is a small app that shows the top 5 processes on your system sorted by memory consumption and CPU usage. It's a small Desktop application that simply lasts he processes and gives the CPU usage, Disk usage and Mem usage for the five hungriest processes. It was made as an alternative to Windows gadgets that do the same thing, because Gadgets are more unreliable and can be buggy.